Setting up a stage for speakers and presenters may seem like an uncomplicated process, however the success of the presentation (and speakers) is subjected to various influences. When you select the venue, consider the number of participants attending and the arrangement of the meeting space. Make the focal point (the stage) visually interesting and functional. Keep speakers, presenters, and podiums in focus to maintain audience interest and draw attention. Since audience sizes, meeting room sizes, accessibility, lighting, budget, program agendas, speaker requirements, and selecting the right microphones and podiums are all key components that will vary dramatically, it’s important to plan for your event to ensure success. Consider placing a large media wall, which compliments the stage design behind presenters or speakers to illustrate their presentation and provide an interesting backdrop for the event. Use a variety of screens and dynamic lighting to keep the speakers (and their message and visuals) the focus. The arrangement of the furniture depends on the type of event you are intending and plays a key role in setting the overall tone (formal, casual, interactive, or conversational) of the event. At the core of every staging event is a sound system designed to bring the optimal listening experience to the audience. Sound is designed to be perfectly balanced and in tune with your venue and your audience, so get the details right. Certainly, the goal is to create a mood and a feeling for guests and attendees so utilize a lighting system designed to create a lasting impression and bring an optimal viewing experience to life. Setting an atmosphere and creating a dramatic first impression is why mood lighting is so vital to any event. Making the necessary arrangements to address these key points can make a huge difference and contribute to a successful event. If you have any questions call Taylor Productions today. Corporate meetings and events are the core of our business. Call Taylor Productions to be at your event to make sure technical difficulties do not spoil the evening. At Taylor Productions, we focus on creating that singular experience that attendees will remember long after they return home. When it comes to choosing the correct microphone for your next indoor or outdoor event, consider a wireless microphone to provide the power to reach—and touch—your audience. A properly designed wireless system offers the same if not better audio quality as a wired system, picking up subtle emotional nuances while filtering out noises not meant to be heard. Wireless microphones are versatile and provide a high level of convenience and flexibility for every audio challenge. When you need clean, crisp sound quality without the bulk and appearance of conventional microphones, wireless microphones are your answer. There are different types of wireless microphones available, including handheld wireless microphones, headset microphones, lavalier or lapel microphones, and instrument wireless systems for guitars and bass. Handheld wireless microphones are great for most lead vocalists, give you that low-profile look and can be seen in productions on stage or in church, DJs, musical concerts, theaters, or any other type of live public address where visual image and high sound quality are important. These high-definition, flexible microphones are less conspicuous and cut down on stage clutter, and are ideal for stage situations in which a microphone will be passed from person to person. When a performer or the production requires the talent to move around a lot, a wireless microphone will give you that benefit. It will enable you to walk freely and perform or deliver your speech more comfortably. They are especially useful in programs that have questions and answer sessions at the end of the presentation. If you have a wired microphone, moving will not be easy; with a wireless microphone — problem solved. If you require a greater amount of flexibility for indoor or outdoor productions, fill the part with convincing power and a wireless lavalier microphone. Though handheld microphones let you walk freely without worrying about the wire, lavalier microphones (lapel mics), simply clip onto the talent’s belt or clothing and allow for a more flexible hands-free operation. By freeing up a person’s hands, lavalier mics are useful when hands-free gestures are important to increase the quality of the speech, drama, or during an interview to explain a point of view. With systems built to suit every application and budget, a lavalier microphone has an extended frequency response and a wide dynamic range, delivering high-quality sound and optimized voice reproduction. They are a perfectly viable option to keep your production smaller, cheaper, and more mobile. This omnidirectional condenser microphone captures the sound around you perfectly ensuring that every detail of the moment is audible. Lavalier mics are typically the go-to choice for theatre work, and are favored by many brass and woodwind players. They also allow interviewers, public speakers, broadcasters, entertainers, and live stage and studio productions to move about freely while using a microphone to amplify their voice. Because the many breakthroughs in digital technology, today’s high-quality wireless microphones are designed to capture the rich, natural sound of an instrument or bring out the best in a vocalist. No matter what you do on stage, the basic setup and operating principles of these wireless systems are all the same, changing the way musicians perform. When mobile flexibility is needed on stage, the lead singer may prefer a handheld transmitter system, bass and guitar may use instrument wireless systems, and the drummer can use a headset system. With major advances in technology, wireless systems sound and perform more efficiently than their wire counterparts, making it the quality choice for your event when you need to capture and project great-sounding audio in a cleaner mobile package. Now that summer is finally here, it’s that time of year when many live events and festivals are happening, offering opportunities and challenges to those involved with providing live sound. Planning live events involves close attention and preparation. To run a successful live event, it’s important to plan ahead, prepare a lot, and organize. Herein lies the key to the important power of live sound. In an event, sound plays a huge role. In this article, we hope to give some insight and share some sound tips to help make your event successful. First thing that you do before running your event is checking the venue. Depending on whether it is indoor or outdoor, you may need to come up with different plans. First of all, let’s focus on the power sources. If you are running an indoor event, power source might not be a big issue. However, you may need to have a backup plan in case of a power cut. Here, the real work starts if you are running an outdoor event. In an outdoor event, you may need to check the power sources and make sure the power source you have is not connected to anything else. Additionally, if it is possible, talk to your other organizers and check whether they have a generator as a backup. Apart from the power sources, clarity of the sound will be the next concern. Both indoor and outdoor events require special attention here. Sound can be echoed. Studying the event location and identifying these potential concerns will be helpful to run a successful event. And, the speakers and paces you use in an indoor event are different from an outdoor event. Thorough planning will help you to overcome some of the issues related to sound clarity. Frequencies that you required will not be available all the time. So, before starting up the event, be sure to check the frequencies and verify whether your wireless microphones have the frequencies that they need. Everything should be anticipated and well planned. Whether your event is an indoor or outdoor event, get a copy of all presentations or a schedule of acts beforehand. Eliminate unnecessary noise between acts – they can be distracting. Review with presenters how to handle a wireless microphone without keeping it too close or too far. Work that should be done in the mixing board should be in written form to avoid mistakes. More importantly, there should be someone at all times at the soundboard. Assign an assistant to handle the last minute details, to allow the soundboard technician to pay full attention in the running event. As mentioned earlier, planning is necessary to increase the clarity of the sound system. When everything is in place, a quick line check is done. Soundcheck each microphone to make sure they’re work, set the voice levels and the gain. Vocal clarity and mix quality are critical to the show. Once vocal levels are set, bring up the other instruments or supporting microphones to match it. This will often be the only chance the soundboard engineer has to hear the microphones before the event starts. Once live, tweak the mix and adjust the overall balance to achieve the best levels for the show, deliver the expected results, and keep everyone happy. Providing the best sound possible for the audience can make it an inspiring event for all. In review, to run a successful event, start the planning process early, decide the requirements of your event, and if you don’t understand something – ask! Better to rely on the expertise of others than try to bluff your way through an event. Remember to keep it simple, and have fun! Whether you’re having a wedding, birthday celebration, live music on the Pier or even just hosting a conference with lots of guest speakers, great sound is the most important decision you can make for the whole event. Yes, the food is important, and so are the table settings, but the sound is what people will be listening to all day or night long. It will inspire their mood and set the tone, and can make a huge difference to the attention of your guests. So don’t let sound fall to the wayside, make the best and most informed decision. What can we offer you? At Taylor Productions, we will customize your experience and determine exactly what it is you’re looking for. We work with you every step of the way to ensure you get that perfect sound. No matter how big or small, we can provide a high quality, professional sound system for award nights, meetings, conferences, events and everything in between. These events can be held is just about anywhere: auditoriums, catering halls, houses of worship, professional buildings, restaurants, sports complexes, universities or schools and any kind of concert, event, theater or dance halls. We have multiple packages, but we are your one stop shop to your event sound system, with packages including staging, light installations and all audio equipment. Our experienced technicians and audio engineers are highly trained to not only provide quality services, but also ensure the entire sound system runs smoothly throughout the night; something that doesn’t always happen. Ever wonder why a speaker’s voice sounds distorted, is hard to hear or muffled? Have you ever been to a conference where the keynote speaker’s voice sounds distorted, hard to hear or just seems to be muffled and you’re pretty sure it’s not the way he’s talking? This can happen a lot, and each venue provides another set of challenges. However, at Taylor Productions, we know what these problems are and are skilled at overcoming them. You may have a few questions on what these problems may be and what the solutions are, so we’re here to answer those for you. Ever wonder why so many meetings have poor sound? Another thing that can easily affect sound are the number of the people in the room. Don’t panic though, because those few people who showed up without RSVP-ing won’t make a huge difference. However, the reason that the number of people can affect the sound is because each person absorbs a small amount of sound, and the more people there are the more reverberating it will be. In simple terms, sound can do three things: become absorbed, be reflected or diffused. With our expertise, we can eliminate two of those problems ahead of time by using the information you gave us and coming prepared. The third problem, diffused sound, is caused by leakage from other rooms. In other words, a room that is not fully soundproof. This doesn’t mean we need to go all-out for a permanent solution to whatever event space you chose, as there are plenty of temporary solutions and we are familiar with all of them. No matter what problem your space may throw up, we have the materials and the solutions to ensure you never face any of those complications. As long as we know the dimensions of the room, what kind of room it is, the number of people and the materials the room is made out of, all of these issues will pose no problem to us. We can easily figure out what sound equipment you need to make your event a total success, with sound that is not only intelligible but also pleasing to the ears. When it comes to sound, we are committed to providing all of our clients with a customized experience, and one that gives them the event they require and imagine. Don’t worry about whether your event space is conducive to good sound and don’t worry about the number of people you will have. With Taylor Productions, you know you’re in good hands and our team will “WOW” your guests with the incredible clarity and fullness of sound, making an enjoyable evening for all. And when there’s one less thing to worry about, you yourself will have an even more relaxing and enjoyable night. Let’s see how we can work with you to supply and operate the most appropriate sound and lighting system for your event. NEW YORK – As landmark soul food restaurant Sylvia’s has grown over the past five decades, its sound system grew in size – but not in quality. Taylor Sound of Long Island, New York recently gave Sylvia’s a sophisticated, yet easy to use commercial-grade sound system centered on a Symetrix SymNet Radius 12×8 Dante networked audio DSP. Inputs to the system include a podium mic, an iPod input, and output from an existing PreSonus studio/live board. The board supports the musicians and vocalists for Saturday Jazz Brunch and Sunday Gospel Brunch, each a longstanding tradition at the restaurant. User control includes a Symetrix ARC-2e wall panel remote for each room, as well as Symetrix ARC-WEB for managers. ARC-WEB allows them to control the system from their smartphones. Taylor Sound (aka Taylor Productions) is installing new Renkus-Heinz TRX81 loudspeakers in each room in phases. 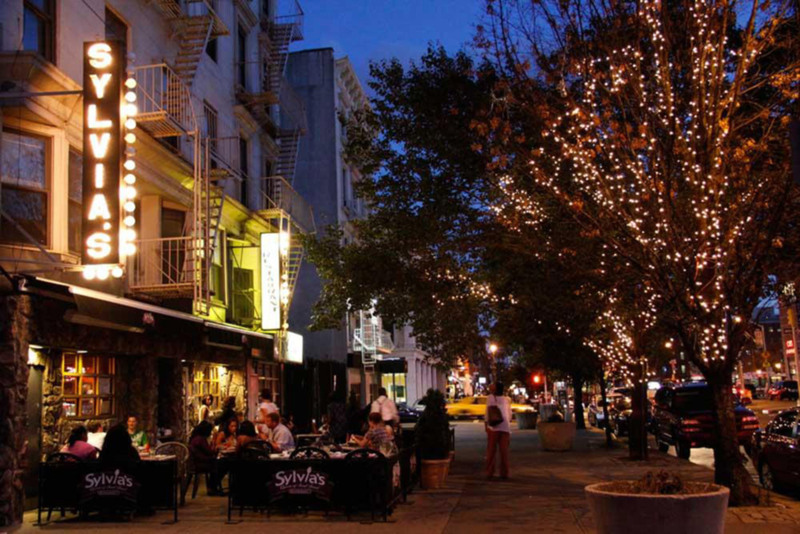 Founded in 1962 by Sylvia Wood, Sylvia’s Restaurant in the Harlem neighborhood of New York City serves soul food that has attained regional and international fame. Numbered among its past clients are Jesse Jackson, Magic Johnson, and the late Nelson Mandela, and its regulars include President Bill Clinton and Reverend Al Sharpton! Over the decades, Sylvia’s has expanded from its original storefront by annexing several of the adjacent storefronts. With each expansion, its sound system grew in size – but not in quality. Taylor Sound of Long Island, New York recently gave Sylvia’s a sophisticated, yet easy to use commercial-grade sound system centered on a Symetrix SymNet Radius 12×8 Dante networked audio DSP. “The Symetrix Radius 12×8 was the first thing we installed at Sylvia’s, and it was almost too good,” said Bill Taylor, owner of Taylor Sound. “They clearly needed new speakers and amplifiers as well, but the Radius was such a step up from their old system that, without an external reference, the improvement seemed more than adequate. We went with the Radius 12×8 because we knew the sound quality would be there and because Symetrix’ open-architecture programming would allow us to give them the customized performance and user-control options that the restaurant needed. Specifically, we wanted to zone out each separate room so that processing and volume could be room-specific.” Taylor Sound designed and installed the new system. Inputs to the system include a podium mic for calling guests when there is a wait (which is frequently), an iPod input, and output from an existing PreSonus studio/live board. The board supports the musicians and vocalists for Saturday Jazz Brunch and Sunday Gospel Brunch, each a longstanding tradition at the restaurant. User control includes a Symetrix ARC-2e wall panel remote for each room, as well as Symetrix ARC-WEB for managers. ARC-WEB allows them to control the system from their smartphones. Taylor Sound is installing new Renkus-Heinz TRX81 loudspeakers in each room in phases.